A great game for younger children. Unlike the other games in the range, there are no words on the fronts of the cards, just fun images! 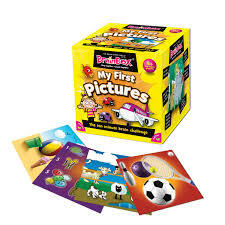 Also recommended for children with reading difficulties.BrainBox My First Pictures is the youngest of the range helping children recognise objects and names of items from household, holiday and everyday scenes. In this game there are 55 playing cards all beautifully illustrated to create the perfect early year’s educational game. This simple concept can be played by all ages and in large groups as well as a 1 person game. Made from a minimum of 70% recycled material, the BrainBox range is fabulous fun. Find out who the BrainBox is in your family – it may not be who you think it is!